I love my classic Kindle; its convenience and simplicity make it the perfect entry-level e-reader. But let’s face it — the Kindle has limitations. With my busy lifestyle, I need a device that does more than simply facilitate the reading of books. 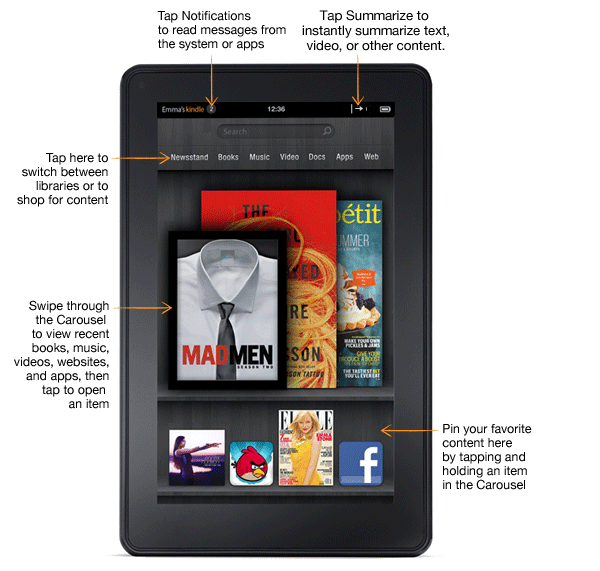 That’s why I was so excited to hear about the new Kindle Spark. You enjoy the first hundred or so pages of Atlas Shrugged, but as you read further, you find the characters increasingly difficult to relate to and the speechifying somewhat tedious. Just hit the “Summarize” button to see how the story turns out. You decide to watch The Seven Samurai because you’ve heard it’s a cinematic masterpiece — but after 10-15 minutes of white subtitles against an almost-white background, you decide you just can’t take three more hours of this. Hit “Summarize”, and the Kindle Spark will instantly convert the film into a movie trailer of whatever duration you want (90 seconds if you don’t specify a length). You don’t want your friends to know that you get all your news from the tabloid headlines you read while waiting in line at the supermarket. Subscribe to as many newspapers and magazines as you want, then hit “Summarize” to receive a highly-condensed version of each periodical as it’s published. A planned software upgrade will include the option to post 1-3 summaries of randomly selected articles to your blog, Facebook, or Twitter account each day. Each summary will include a reference to the original periodical (“Just saw this on The Economist today”) and a link to the original article. At $219, the Kindle Spark isn’t exactly a stocking stuffer, but it does make a great gift for someone who loves to read but never seems to find the time to actually read anything. Need more last-minute gift ideas? For the cat-lover on your list, consider the CatSofa or the Squeaker 3000 Robotic Toy Mouse. Atlas isn’t the only one who shrugged…. I’d have thought there would be higher numbers for “Internet Cats” on the facebook summary. Are you sure that thing is working right? I sometimes go an entire day without seeing an Internet cat in my Facebook stream. Maybe Facebook is broken. So I can use the Kindle Spark summary to say that I’ve read more books than I actually have and appear smarter? I want one. Fun fact: the first sentence of your comment is exactly what you’d see if you read this blog post on the Kindle Spark. It’s a cheat sheet! Wow – who would have thought? Well, you blew it. You shouldn’t have posted this, you should have patented this idea. Imagine the possibilities! Text books!! You’d have made millions, bought a mansion and had an LOL cat in every room. Now you’ll just be stuck with us 99%’ers. That’s okay — I still have another product idea I can patent. It’s a voice-activated purse — you say things like “car keys” or “four dollars and eighty three cents”, and it dispenses the item you asked for. Don’t tell anyone. Brilliant! My lips are sealed! But will it make me a sandwich? The “summarize” feature reminds me of those short videos with the fast-talking lady who explains the entire plot of “Lost” at the beginning of each season. I have an original CatChair and didn’t even know it. I should probably take it to the folks at “Antiques Roadshow” and get it appraised. I need one of these to not only summarize my life, but to go on all those social network sites and blogs and things and leave comments and likes and things like that so I don’t have to waste my time doing it personally. Not including your blog (INSERT TITLE HERE), which I absolutely adore. That’s the most sincere compliment I’ve gotten all day. Are you sure there just isn’t an upgrade pack that I can get for my first-gen, circa 2008, $359 Kindle Pyre? How many books can you store on that thing? Three?